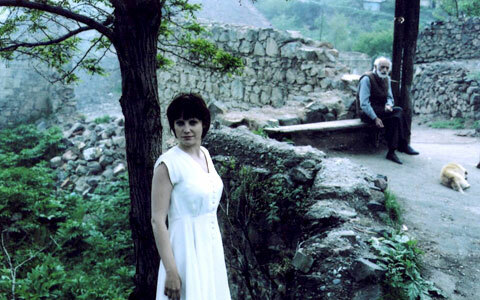 The Lighthouse (Mayak) by Maria Saakyan is a film I first saw at the London Film Festival in 2007. Perhaps too naïve in my burgeoning education into cine-literacy, all I managed to note from the screening was that it was hard to summarise, and in a sense that stays true today. In her essay Of Lights and Houses: Maria Saakyan’s The Lighthouse, The author Sophie Mayer intermittently repeats one sentence that could be considered to summarise the film: ‘A girl comes home.’ True that this is the central plot of Saakyan’s beguiling debut but the film’s audio and visual pleasures are such that this simple description expands to encompass such grand themes as memory, nostalgia, identity and loss. The girl in question is Lena, a young woman who returns to the remote village in Armenia that was once her home. Set during the time of war between Armenia and Azerbaijan, Lena attempts to persuade her grandparents to leave and travel to Moscow with her. Her pleading with them is however only one aspect of Lena’s time at home, as she also helps her friends and neighbours with the daily domestic routines, wanders the hills around her and makes several desperate attempts to leave herself. Each scene blends indiscernibly into another, accompanied by a haunting score by Kimmo Pohjonen, so that linearity becomes as irrelevant as memory can be unreliable. Lena appears at once happy to be home, shocked at the violence and trauma now perpetual in the lives of those she cares for, and desperate for the happiness that she remembers to return. Demonstrating it’s aesthetic influences clearly as Tarkovsky and Paradjanov, Saakyan’s film is startling for its use of colour – a palette of blues and greens pervades the image, making the interruption of red light from the explosions outside that bathe the interiors Lena’s home even more powerful. Shots of Lena in her bedroom are particularly resonant of Vermeer, as light through the window casts a melancholy shadow on the wall. This beauty is at the heart of the tension in the film – a central character who clearly loves her homeland and the habits and rituals of her former community, but who cannot bear that beauty to be violated by the violence of war. To be there is to simultaneously experience beauty and tragedy. Cuts to archival footage of families suffering loss during wartime make clear that peace is fleeting, and the land is marked by the impact of conflicts past. The artistic achievement of The Lighthouse is not the only triumph of the film, for it is also the first feature film to be completed by a female director in Armenia. This accolade represents a determined break with the tradition of filmmaking in the country, but it is testament to Saakyan’s skills as an artist that it will not be simply this that makes the film so memorable. I often thought of this film in the years since first seeing it in London, and wondered if my memory of it would match up with a second viewing. Not only has the film become richer and more marvellous on second viewing, I have discovered it is one that deserves to be seen again and again. The Lighthouse is distributed by Second Run DVD. ← How am I not myself?